For £80,000 you could buy a one-bedroom flat in Victoria Beckham`s home town of Harlow in Essex and still have £10,000 left over. But for fashionista Victoria that is simply the cost of her newest handbag - a designer Birkin bag studded with hundreds of diamonds. The silver Himalayan was Victoria`s Christmas present from husband David and cost the footballer nearly a week`s worth of his wages at AC Milan. As the rest of the world draws in its belts and tries to ride out the recession it appears that the Beckham`s are feeling more extravagant than ever. Victoria showed off her new piece of kit, one of only three in the world, as Beckham made his debut for the club in Dubai. 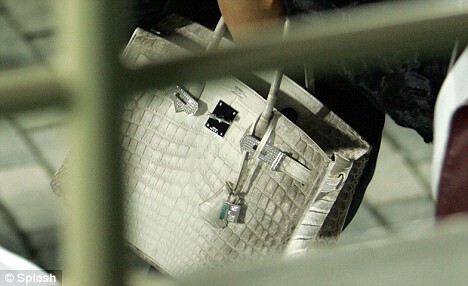 The 34-year-old former Spice Girl is said to be `delighted` with the bag, which features a three-carat diamond on the lock. The waiting list for a Hilmalayan like Victoria`s has closed, with those already on it having to wait four years. Victoria and her three sons are currently in Italy, where they are staying with David for a few days as he settles into his new role. David is on a three-month loan to AC Milan from LA Galaxy to keep up his fitness levels ahead of the Spring World Cup qualifying matches. But Vcitoria`s visit is only temporary, as England star Beckham has confirmed that she won`t be moving with him. In a bid to avoid disrupting their sons` schooling, Victoria will continue to live in Beverly Hills while David resides in Italy. David said: `Victoria will come back once or twice a week to be with me and spend time in Milan, so I`m very excited about that.